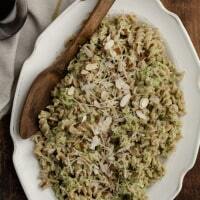 Broccoli-Almond Pesto Pasta | Naturally. I am a notorious ‘buy vegetables and forget about them in the refrigerator drawer’ kind of person. If I don’t go into the grocery store/farmers’ market with a shopping list, it ends poorly with me overspending, especially with produce. I end up with a short attention span: “Look at those colors!” “Oh, the flavor must be amazing!” “1 pound for $2!” At the end I have a ton of beautiful produce and then realize, I have a lot of cooking to do for the week. For whatever reason, broccoli and cauliflower are two items I constantly forget about. 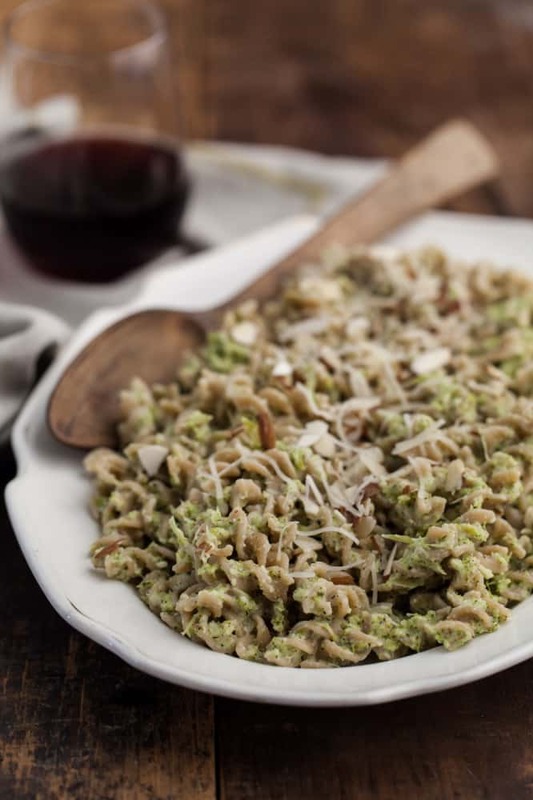 This broccoli pesto is such a cheat and while it’s definitely not the full-force flavor you might be used to with basil pesto, the flavor is subtle from the roasted broccoli and it pairs perfectly with pasta. I also cut back on the amount of oil/lemon juice traditionally used by pour a bit of pasta water into the sauce but feel free to play around with the balance of oil/lemon juice. Preheat oven to 425˚. Cut broccoli into roughly equal-sized florets, keeping as much of the stem as possible. Toss with sliced onion, 1 tablespoon olive oil, salt, and pepper. Roast until broccoli is just starting to char, 15-18 minutes. Bring a pot of water to a boil with a pinch of a salt. Add pasta and cook until tender but not mushy. Drain, reserving at least 1 cup of water. 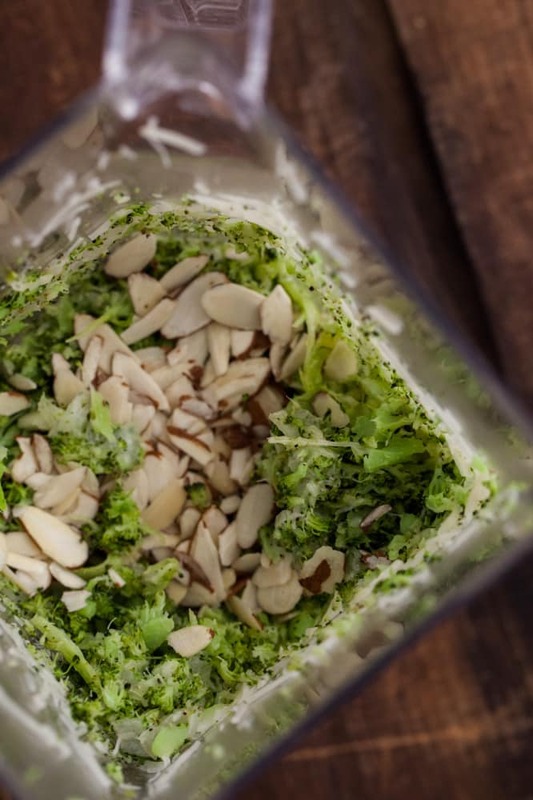 Place cooked broccoli in blender or food processor with remaining olive oil, lemon juice, almonds, and cheese. Puree, add 2-3 tablespoons pasta water at a time, until a thick sauce forms (will look more like a dip than a sauce). Taste and add more salt/pepper as desired. Combine with hot pasta. Serve with a sprinkle of slice almonds and extra cheese. Great way to use up limp broccoli! 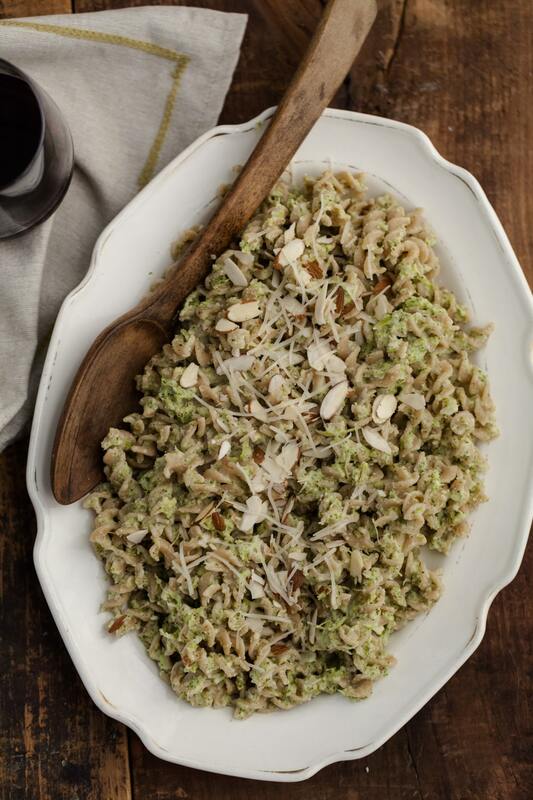 Broccoli + pasta is one of our favorite combinations. I am sure my family would devour this dish. You are not alone in the overspending on veggies just to forget about them. This pesto is an awesome use of an ingredient I often overbuy. Thanks for sharing. So inventive!! i used to be real bad about forgetting vegetables and having to end up freezing them, lately shopping list has been a huge help. What a great use of broccoli! I love eating it and have been looking for more adventurous ways of cooking with it! This is such a great idea, Erin! And I always overbuy at the farmers market. Everything looks so good, it’s hard to control myself. Broccoli pesto sounds great! Love this recipe! It would never have occurred to me to make broccoli into pasta. This is such an intriguing idea! NOM. Ummmmmm yum! This looks divine,lady! I LOVE broccoli and sadly my fiance does not, but I might be able to make him ok with eating it if I turn it into a pesto (one of his favorites)! Hopefully, I can try this soon. And I love cauliflower. It’s delicious roasted with olive oil, s&p, and cumin or garlic – simple. I also love it pureed as mashed “potatoes” – it’s a winner with everyone! 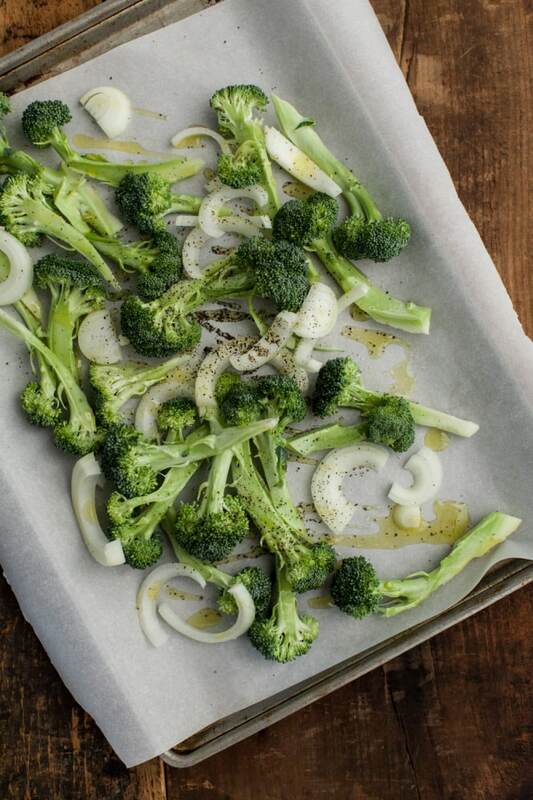 Thanks for the great idea to roast the broccoli and onions first! I had to chuckle when I read this post as I do the exact same thing. I MUST have a grocery list or I get carried away, over buy, over spend, and feel guilty at the end of the week when I see sad, wilted veggies pushed to the back of the fridge. This recipe is a great way to revive the forgotten broccoli. Sounds delicious! I love the delicate flavor of broccoli pesto and I would make this right now if I didn’t already have dinner prepared. We eat a lot of broccoli with pasta. You could try tucking some of the cauliflower into the pesto if you have both at the same time, which is what I did for dinner last night. . I often tuck in a bit of chilli as well, as it goes beautifully with broccoli. Great recipe, thanks for another way to use up the broccoli. This would be a great make-over meal too. Tonight’s roasted broccoli is tomorrow’s pesto! Great idea! I love using broccoli as the green. Absolutely making this one! Wow, looks like a really healthy pasta dish … I’ll have to try this soon! Delicious and perfect for those transitioning into fall nights. I love the idea of roasted broccoli. Ha – I’m the same way with my produce and I’m usually in denial about it so it ends up sitting in the crisper drawer for about 2 months too long because I’m embarrassed that I forgot / wasted it. Glad to see you’ve found a recipe for your forgotten veggies! Thanks for this recipe. I normally don’t like broccoli-type food. But this def give me a reason to do something interesting with it for a change. Btw I am new to your blog and will def return for more. I’m not a big fan of broccoli but keep trying because it’s so healthy. This was delicious though, and perfect for a rainy evening. I used whole almonds that I roasted and just chopped a few for garnish. I just cooked did and it turned out amazing. Super easy and tasty!!!!!!! Adding this to my go-to recipes when trying to make something delicious and easy! Loved this recipe. It came together quickly and was delicious.